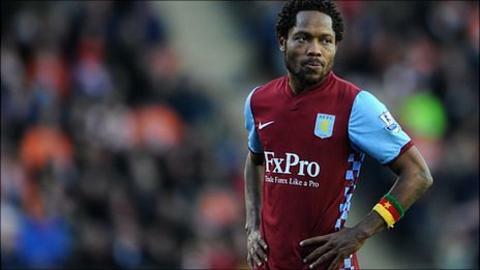 Aston Villa's Cameroon international midfielder Jean Makoun has joined Olympiakos on a season-long loan. Makoun, 28, has 54 caps and has scored three goals for his country. He joined Villa for £6m from Lyon in January but has struggled to make it into the first team, only make eight appearances. Following his loan Olympiakos can buy out his contract next season. "I wish him good health and to join quickly the Olympiakos family," said club owner Vangelis Marinakis. "He is a player with great performances and comes to Olympiakos in the most productive age." Makoun, who began his career at Lille, said he was pleased to join Olympiakos and that he would do his best for the club to win another league title "and to do whatever possible to do well in European play." "I hope to achieve what I accomplished with Lyon, to go as far as possible in the Champions League and to play good football," added Makoun.